Singing humpback whales from different ocean basins seem to be picking up musical ideas from afar, and incorporating these new phrases and themes into their songs. A breaching humpback whale in the waters of Gabon in Western Equatorial Africa. Image via ©Tim Collins/Wildlife Conservation Society. New research suggests that humpback whale populations in the Atlantic and Indian Oceans are picking up musical ideas from one another, and incorporating the new phrases and themes into their songs. 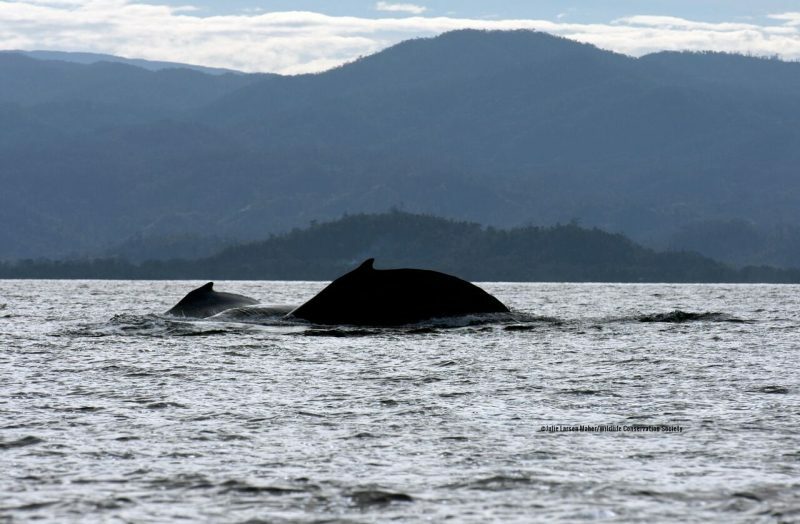 According to the study, published November 28, 2018, in the peer-reviewed journal Royal Society Open Science, humpback whale populations in different Southern Hemisphere ocean basins (the South Atlantic and Indian Oceans) sing similar song types, but the amount of similarity differs across years. This suggests that males from these two populations come into contact at some point in the year to hear and learn songs from each other. Humpback whales swimming off the coast of Madagascar, one of the study’s two research sites. Image via ©Julie Larsen Maher/Wildlife Conservation Society. Individual animals sing complex compositions consisting of moans, cries, and other vocalizations called song units. Song units are composed into larger phrases, which are repeated to form themes. Different themes are produced in a sequence to form a song cycle that are then repeated for hours, or even days. For the most part, all males within the same population sing the same song type, and this population-wide song similarity is maintained despite continual evolution or change to the song leading to seasonal hit songs. Some song learning can occur between populations that are in close proximity and may be able to hear the other population’s song. The study authors examined humpback whale song recordings from both sides of the African continent — from animals off the coasts of Gabon and Madagascar respectively — and transcribed more than 1,500 individual sounds that were recorded from 2001 to 2005. The researchers detected shared phrases and themes in both populations that developed over time, with some years exhibiting more similarities than others. For example, in the beginning of the study, whale populations in both locations shared five themes. One of the shared themes, however, had differences. Gabon’s version of Theme 1, the researchers found, consisted of a descending cry-woop, whereas the Madagascar singers split Theme 1 into two parts: a descending cry followed by a separate woop or trumpet. Other differences also emerged. By 2003, the study says, the song sung by whales in Gabon became more elaborate than their counterparts in Madagascar. 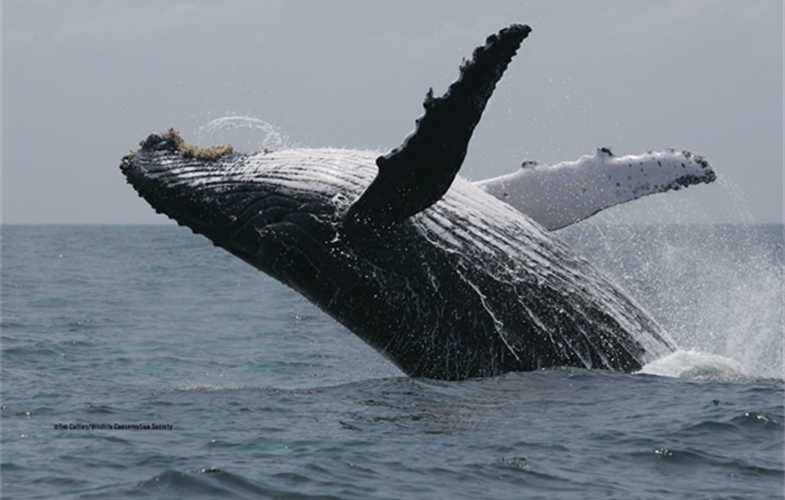 In 2004, both population song types shared the same themes, with the whales in Gabon’s waters singing three additional themes. By 2005, songs being sung on both sides of Africa were largely similar, with individuals in both locations singing songs with the same themes and order. However, said the researchers, there were exceptions, including one whale that revived two discontinued themes from the previous year. Song-sharing between populations tends to happen more in the Northern Hemisphere where there are fewer physical barriers to movement of individuals between populations on the breeding grounds, where they do the majority of their singing. In some populations in the Southern Hemisphere song sharing appears to be more complex, with little song similarity within years but entire songs can spread to neighboring populations leading to song similarity across years. Our study shows that this is not always the case in Southern Hemisphere populations, with similarities between both ocean basin songs occurring within years to different degrees over a five-year period. Bottom line: New research suggests that humpback whales are picking up musical ideas from whales in other ocean basins, and incorporating these new phrases and themes into their songs.